LGMD2N is a very rare form of recessive LGMD, and it is caused by mutation in the POMT2 gene (Table 17.1), which also causes a severe congenital muscular dystrophy-dystroglycanopathy with brain and eye anomalies and congenital muscular dystrophy with mental retardation. The onset of weakness occurs after ambulation is achieved. Of the few patients so far reported, one had onset at 18 months, achieved walking, and had increased serum creatine kinase level, muscle hypertrophy, low IQ, and right bundle branch block on echocardiogram. 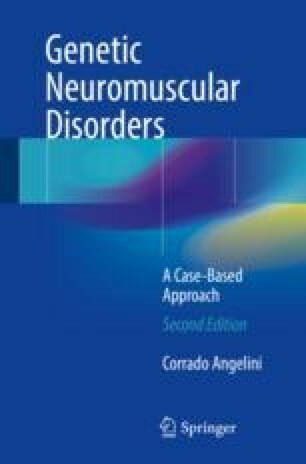 MRI was not performed, and another 5-year-old Italian girl showed normal psychomotor development in the first year of life but learned to walk at age 18 months. Physical examination showed calf hypertrophy, increased serum CK level, and mild muscle weakness. Muscle biopsy showed dystrophic changes, inflammatory changes, and severely decreased alpha-dystroglycan. Brain MRI, ophthalmologic examination, and cognitive development were normal.